Ann Conway is a sociologist and writer with more than 20 years of public health experience. She has a doctoral degree in sociology from Brandeis University and a Master of Fine Arts in nonfiction writing from Seattle Pacific University. Conway's work has appeared in Maine newspapers as well as "Maine Arts" magazine, "Image Journal" and "Faith and Leadership." Bread crumbs provide a crispy coating for baked chicken and fish and they bind ingredients together in meatballs. But packaged bread crumbs often contain high levels of corn syrup and sodium as well as potential allergens, such as wheat and sunflower seeds. Other ingredients can include hydrogenated oils, which contain trans fats, linking them to heart disease. Luckily there are many flavorful alternatives. Bread crumbs are easy to make. For soft bread crumbs, simply cut bread into cubes, or croutons, and crumple or grind briefly in a blender or food processor. For dry bread crumbs, cube bread and let dry for 24 hours. Or place the croutons in a 200 degree oven for 30 minutes -- while some recipes call for higher temperatures, drying at this low a temperature extends the life of the crouton. Then grind briefly. Any kind of bread or cracker can be used to make bread crumbs, as can cereals such as Grape Nuts. Try rye, corn or soy bread-based bread crumbs for extra flavor. Be creative: add herbs such as basil, oregano or parsley. Crumbs made from raisin or sweet breads are particularly flavorful in stuffing or stews. Packaged Panko bread crumbs are made from Japanese white bread and produce a crispier coating than ordinary bread crumbs. They contain far fewer additives and sodium and absorb less fat. While you can make your own, it may be difficult to find Japanese white bread outside of metropolitan areas. 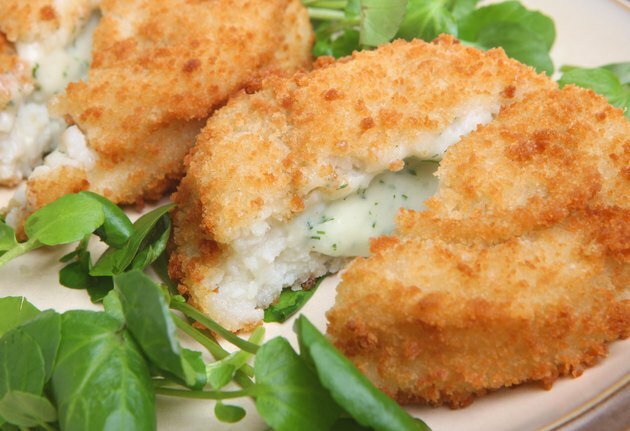 Panko bread crumbs can substitute for bread crumbs in any recipe. Colorado State University Extension recommends rolled oats or cracker crumbs as an easy substitute for bread crumbs. Ground flaxseed can also be mixed with oats for heart-healthy benefits. Other possibilities include Parmesan cheese, or ground-up nuts. For gluten-free alternatives, use cooked rice or make crumbs from your favorite gluten-free bread or crackers. Store bread crumbs in an airtight container or place them in a plastic bag and freeze for up to three months.